Here I am, all zipped up in my immersion suit. I’ve donned an immersion suit, also known as a survival suit. One of the first things I did when I came aboard was to locate this suit and my life vest, two pieces of equipment that save lives. 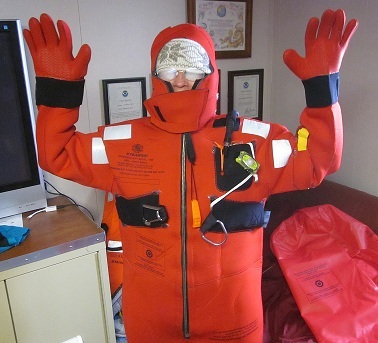 In the event we had to abandon ship, the survival suit would keep me both warm and afloat until rescue. During our evacuation drill we needed to unpack and get into the suit, and be completely zipped up in 60 seconds or less. Getting into the suit was much easier after I took my shoes off, as the soles caught on the fabric of the suit. The suit is made of neoprene, which was invented in 1930. SCUBA wetsuits are also made of neoprene, and even some laptop and tablet cases. In an earlier blog I talked about the CTD being used to calibrate the sonar aboard the Oscar Dyson, but not all technologies on the Dyson are as high tech as the CTD and sonar equipment. In fact you can build a weather station at home that is similar to some of the equipment used by the Dyson’s crew. Below is a picture of a hygrometer. There are actually two hygrometers aboard, one is located on each side of the bridge. Hygrometers are used to measure relative humidity (how much moisture is in the air). Also pictured is the wind bird which shows the direction the wind is moving. The propeller was actually turning rapidly when the picture was taken. The camera was able to “stop” the action. 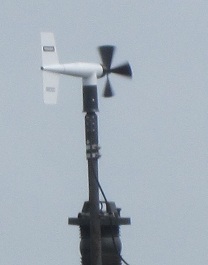 The wind bird is mounted atop the jack staff, high above the bow. Hygrometers are weather instruments used to measure relative humidity. The following link shows you how to build six instruments for monitoring the weather. If you checked out the above link, how many snow days to you think the kids in North Dakota had? Did you check out ship tracker? If you did, the screen shot below will look familiar. The blue lines in the water display the Dyson’s course. Each segment of the course is called a transect. Transects are numbered, enabling scientists to easily reference a location. Transects run perpendicular to the coast line, covering a wide range of bathymetry over the shortest distance. 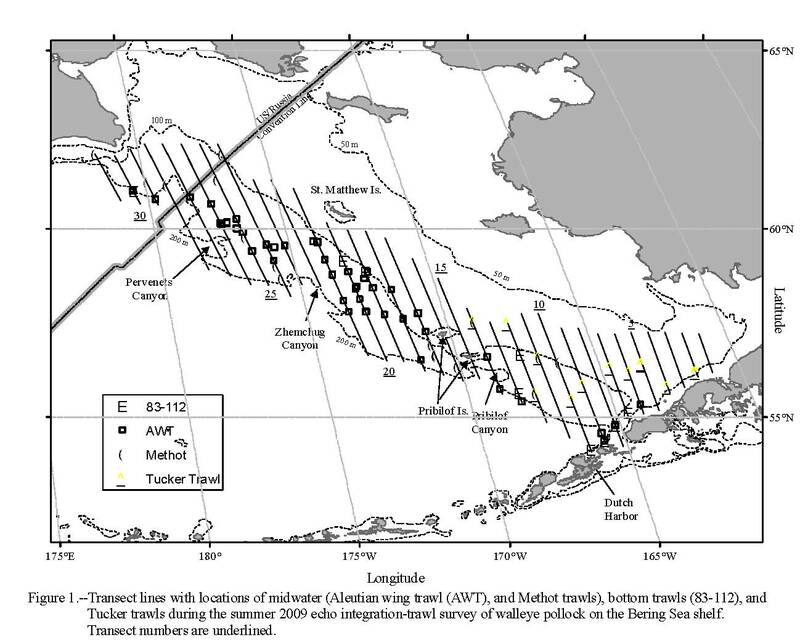 Regularly spaced transects (as opposed to randomly spaced or scattered) are correlated with historical data, and are the best way to describe the distribution of pollock. The combination of transects collects sufficient data to allow scientists to estimate the overall size of the pollock population with a high degree of certainty. Does anyone have an idea about the meaning of “bathymetry” and a “leg”? No, in this case a leg is not something you stand on. Bathymetry is the shape and depth of the ocean floor, and a bathymetry contour line on a chart connects points of equal depth (like a topographic map). A leg, in this context, is a segment of the overall distance covered in the survey. The information collected during this year’s survey helps determine the number of pollock that can be caught in next year’s fishing season. 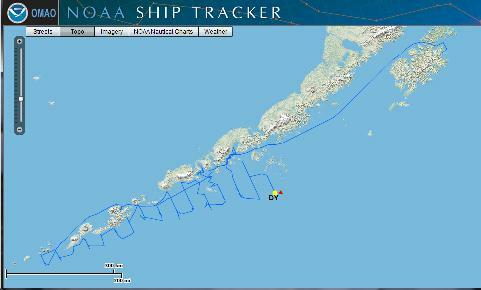 Here is the ship tracker link, you can check out the Dyson’s course and other NOAA ships as well. I want to revisit the sonar of Mystery Mix One. In my last blog I talked about what was happening near the surface of the ocean. This time I want to focus beneath the sea floor. Look beneath the red, yellow, and green bands, depicting the sea floor, at the blue color, notice how the density of color changes over time. The density of the color tells scientists about the composition of the sea bed. The denser the color, the denser or harder the seafloor is likely to be; probably, the places with the dark, dense color are rocky areas, which attract the fish schools seen in the water above. Looking at this graph reminds me of an experiment that my husband worked on, when he worked for Charles Stark Draper Labs, in Boston, MA. He worked on a Gravity Gradiometer that was sent to the moon on Apollo 17. The gradiometer measured the changes in gravity. The changes in gravitational strength give scientists information about what lays beneath the moon surface, like the sonar provides information about the sea bed. The Gravity Gradiometer was a very specialized version of equipment that is commonly used in prospecting for oil on Earth. I am sharing this story because, in class, one of our foci is to take what we know and apply the knowledge to a new scenario. Next question: Where will what we know now, take us in the future? Some fish can see color. Life aboard a ship is difficult to comprehend until you have experienced it first hand. If you forget something, oh well, and you live with what you have for the duration of your leg. Planning ahead is huge for a mission to the Bering Sea! (Sound familiar students?!) Life at sea can be much slower than I think people believe it to be. On this particular type of cruise, much of the day is spent waiting, watching, and analyzing information. While everyone has their job, some of those jobs require patience and flexibility. Ever have that moment when a demonstration fails, the cool lab you worked so hard on doesn’t work, there’s a schedule change thrown into your day, or maybe that special dinner you were planning didn’t taste right? It happens on the boat too! You have to be prepared and understand that it is going to happen. Equipment failure, human error; they all happen on board. 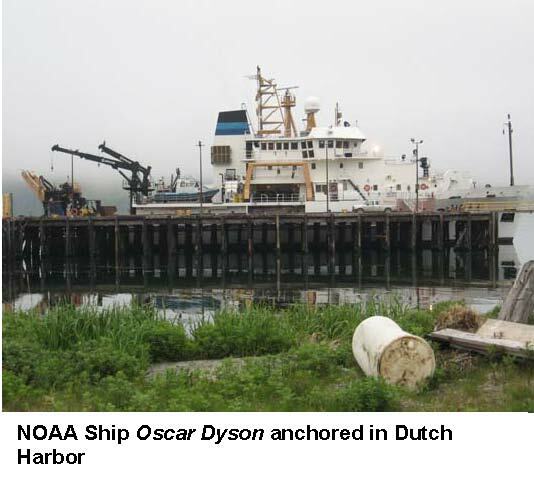 I arrived in Dutch Harbor on June 26th and we were scheduled for departure on June 27th. There was a broken crank shaft in one of the large generators so our departure from Dutch Harbor was an educated guess at best. Without the generator, we would be in short supply of fresh water for a ship holding 39 people until July 16th. There wasn’t anything that we could do so we took advantage of being in Dutch Harbor for a couple of extra days until we departed on June 29th. 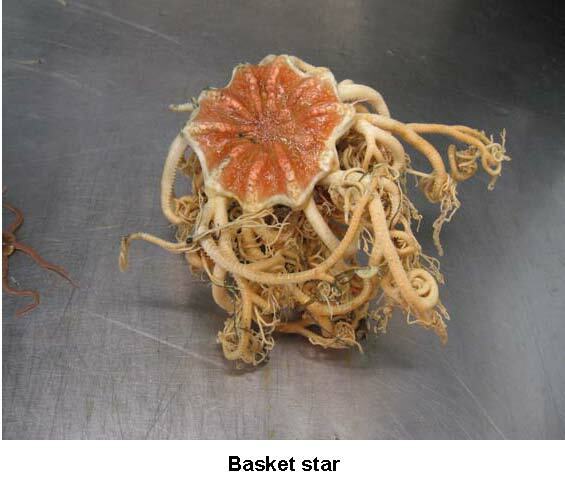 Maybe the copper wire was cut before it reached the bottom on an XBT or there was a hole in the trawl net that needed to be mended. That part of life on board is no different than any other environment. It’s an albatross, an orca, a tree? Talk about patience…the mammal observers have lots of it. 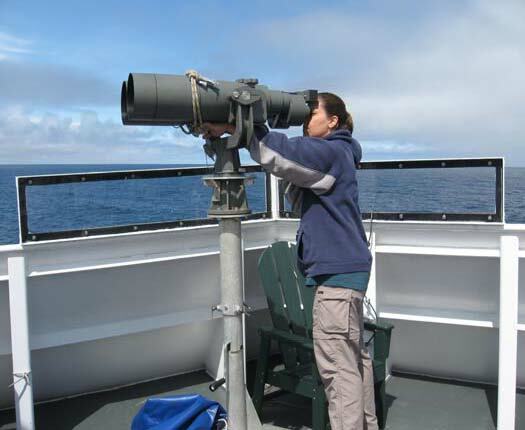 They are on watch constantly looking along the horizon for blowholes and other signs of mammalian life. When observations are slow, anything in the water can become exciting. Earlier this week while I was on the bridge, the mammal observers called down from their observation deck to the bridge because there was an object in the water that we were getting closer to. You could feel the excitement from everyone growing as this magnificent object grew closer. We got our cameras ready because this could be “the” picture of the trip and positioned ourselves to take the shot of our lives. As we approached this rather large piece of unidentified matter, we realized that it was a piece of driftwood with murres hanging out on it. At this point, the adrenaline rushed out of me and laughter took over. None of us could believe how excited we became and how let down we were to find out it wasn’t a mammal at all. Back to the observation deck! You can’t force the fish! My primary job on this boat is to help with the fish surveying. Using the acoustics helps decide when the trawl nets are deployed for fishing. 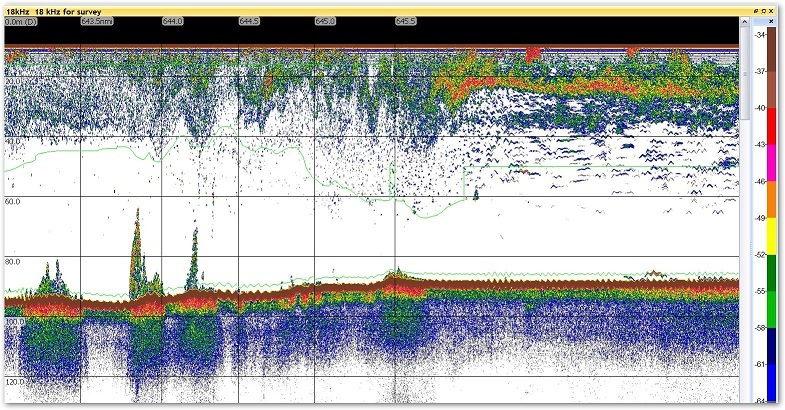 In order for fishing to occur there needs to be at least 2-3 miles of pollock showing up on the transducer screens. Weather also plays a role on what we see on the transducers. We have been very pleased with the weather so far; although it has been foggy, that usually means calmer seas. Later in the week, the weather is supposed to get dicey. When this happens there is a chance that it will be too rough to fish even if we do see the pollock. Look for my journal on weather after the weekend! Since the start of our journey we have fished three times during my shift and deployed the Methot a few times. When we are not fishing we find other things to keep us busy. Some people are analyzing data, checking equipment, or if you are a teacher at sea, you may be documenting all of your experiences. I have never taken so many pictures! The down time gives me a chance to talk to others on the boat to see what other operations are happening. As my friends and family know, I have a hard time sitting still. This is the perfect place for me to be because I have no choice but to slow my pace! It’s REALLY hard, but I think I am doing a pretty good job! What shift are you working? Aside from the flexibility needed to work on the ship, you also need to be flexible and patient just to live on board. Remember, you can’t just leave the ship when you need a break! The boat runs 24/7 so there are lots of shifts on the boat. To give you an idea you may be on watch for 4 hours in the dead of the night, or you may be observing mammals from sunrise to sunset. 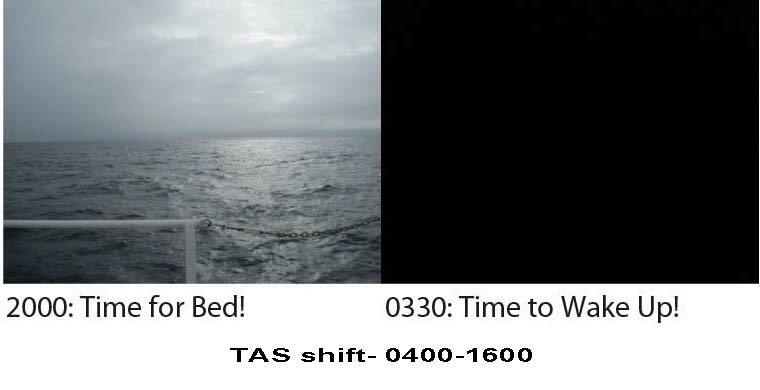 I was lucky to land the 12 hour shift from 0400-1600, but the other fisheries crew comes on for the remaining 12 hours of the day. I say this because with a full crew of 39 people on board and with everyone working different shifts, there is etiquette on board a vessel. If you and your roommate do not have the same shift, it is the unwritten rule not to enter the room while they are sleeping. That means you need to take everything with you for that shift. Not everyone eats during the allotted times that the mess hall is open so food is often set aside so everyone can have their meals regardless of what shift they work. 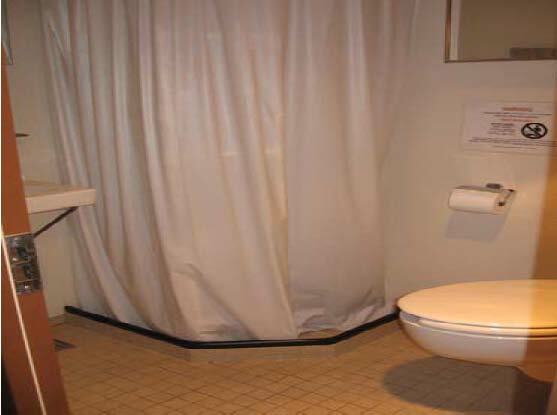 Taking showers need to be short because everyone would like to take a hot shower after 12 hours of working. Appropriate volume is important because there may be people sleeping in the stateroom next to you and you don’t want to wake them while they are trying to sleep when off shift (remember inside voices!). It makes you very aware of your surroundings. I absolutely lucked out because Rebecca (the other TAS) and I have the same shift and same schedule. We have it much easier than most people on the boat that have opposite shifts. Need time away from the hustle and bustle of life back on land? Need to take a break from your TV, cell phone, blackberry, I phone, and the internet…the Bering Sea is the place for you! 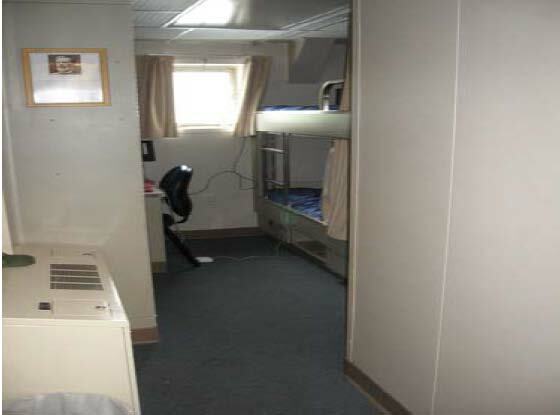 Even though there is a phone on board that allows you to call off the ship, it is extremely expensive so it is definitely not for everyday use. Phones don’t work here so you can save the batteries in your cell phone or I phone for home. Most of them actually don’t even work on Dutch Harbor either. As far as the internet is concerned, that’s a little trickier. As you may have noticed, my journals took a while to be posted. It is very difficult to send information via internet from the Oscar Dyson. If we are traveling on a northern transect, we may not get internet the entire time. The transect itself could take 2 days to complete running at 12 knots! If we are turning or heading south, we may get lucky for a while. Therefore it takes time to get all the information and pictures sent just to be posted. It is very hard to be patient because I want everyone to know what’s happening and all the cool things we have been doing. Internet is sporadic at best, but keep the emails coming! It is nice to hear from everyone back home! 2 types of cockles- Clinocardium sp. and Serripes sp.